Before removing a wisdom tooth, your dentist will give you a local anesthetic to numb the area where the tooth will be removed. 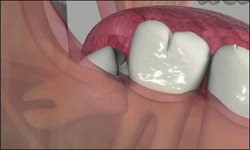 A general anesthetic may be used, especially if several or all of your wisdom teeth will be removed at the same time. A general anesthetic prevents pain in the whole body and will make you groggy or cause you to sleep through the procedure. Your dentist will probably recommend that you don't eat or drink after midnight on the night before surgery, so you are prepared for the anesthetic.